Summer is just around the corner, friends! Who’s ready for long days, warm nights, sunshine, and maybe even some sand between our toes?! Summer makes many of us want to get up and get out. Of course, being the animal lovers that we are, we always want to bring our 4 legged, fury friends with us. On those hot days (and even days that we don’t find so hot! ), be sure to keep a few things in mind. First, don’t “weekend warrior” your dog. By this, we simply mean you shouldn’t expect your dog to be able to run 3 miles with you if he hasn’t been properly exercised all winter. Just like people can’t get up one day and decide to run a marathon, dogs can’t either. This can be hard on your dog’s muscles, joints, lungs, and even heart. It’s best to start out slowly with your dog and work him up to whatever goal you have set. Second, be sure to take breaks during your outdoor activities. You could also let your dog cool off by swimming, if they enjoy that. Bringing along water and a bowl for your dog is also a great idea, as it is best to not let your dog drink out of puddles, ponds, rivers, etc. due to parasites and diseases they can contract. Also, if it is particularly hot, cut your activity short. Some days are just too hot. If the pavement is too hot, walk your dog in the grass. How can you tell if the pavement is too hot? Take the back of your hand and place it on the pavement. If you can’t hold it there for at least 5 seconds, it is too hot to walk your dog on it. Either wait until it is cooler or walk your dog on the grass. In the summer, it is best to walk your dog early in the morning or in the evening, when the sun isn’t at the highest point. Never, ever leave your dog in the car. Even if you’re just running a “quick errand” or it’s just “warm” outside. The temperature in the car rapidly rises and can seriously harm or even kill your pet in minutes. 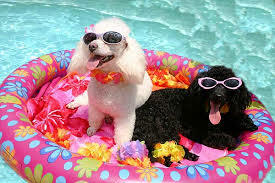 Finally, do not leave your pet outside for extended periods of time, especially if they have no shade or water. 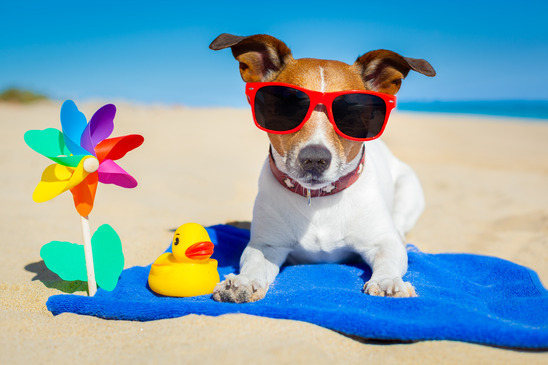 We understand that some pets just prefer to be outside and that’s ok. Just make sure they have a safe place, such as a dog house, to cool off and access to plenty of fresh water. Keep these things in mind and you and your pets can enjoy the fun of summer! I just got a dog but not know what risks summer can present to him. Thanks for the advice about taking breaks from the heat and not leaving him outside if there is no respite from the sun. I’ll have to make sure that I get a vet on hand just in case my dog suffers any ill effects from the heat. Letting your dog cool off by swimming does seem like a smart thing to do when you out in the heat. It would be smart to know that and have a little pool ready for your dog to swim in. It also should have a plan on where to take your dog if you notice they are noticing they are having a hard time.